O'Reilly Radar recently put it as "…is iOS then still to be judged primarily as a communications device platform? Or, as a low-end gaming disruptor to Microsoft Xbox or Nintendo Wii in the living room?". And I agree, if we're seeing a shift to a more casual gaming scenario where more and more people will pick up a game if it's easy and natural what better platform then the one in your pocket? Or the one on your current laptop? This reduces the barrier of entry to gaming to zero, or at least .99. "For One Quarter of Users, the iPad is a Game Machine", which I again agree with. Not only is it capable of great visuals - it's convenient, comparably inexpensive, and touching is a great way to interact with games "naturally" (like a Wii remote or the Xbox Kinetic). The article goes on to say "38% of iPad owners responding to the survey indicated that they had no desire to purchase a different mobile gaming device." - and for some, I'm sure this is their only gaming device. Gaming apps continue to take the top spots on mobile devices: "Gaming apps once again took the number one spot for and accounted for 41 percent of apps on the network in June" - this article also mentions iOS growing 36% to 56% of the total US smartphone mix. Titles like "mobiles are the consoles of the future" are becoming more common, "by the end of this year, there will be 120 million iOS devices in circulation - only 20 million shy of the most popular console of all-time, the PS2, which has sold 140 million units." - again, not everyone is playing games on their mobile devices, but with these numbers comes great potential! Data from Resolve Market Research shows that after owning an iPad, you're 38% more likely to NOT by a portable gaming device (like DS or PSP). Which makes iOS devices like iPad and iPhone prime targets for Nintendo and Sony (as if Sony isn't already going after Apple). I think the iOS devices have shown that they're not just for Snake and Tetris. First person shooter games like Archetype, show how "console like" online mobile gaming can work. And Words with Friends, and other turn based games excel on mobile "go with you anywhere, always connected" devices. When Google announced the Chrome App Store, a majority of the non-Google app were games. Even demoing "Lego Star Wars", which is a pretty rich console game. While I don't think it's total clear yet, Google is moving to a web app strategy - and we're already seeing HTML5 gaming engines - like Aves, show some promising demos. And games like Pie Guy have been out for awhile now, showing some basic HTML gaming on the iPhone. What's also interesting is Apple's "here's the platform, let's see what people do" attitude - and people gamed, and now they're releasing their "Game Center" hub that will better connect players to their games. 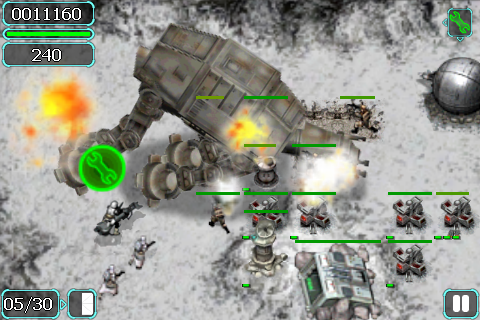 Personally I love gaming on the iPhone, and iPad - and just last week was excited about, and waiting for a game to come out - Star Wars: Battle for Hoth. But then happy finds, like Helsing's Fire shows me innovation with touch based gameing is far from over! A lot of these smaller, fun games also bring down the cost, from million dollar blockbusters to something that can be made in 72 hours, with a small team. My 5yo also really enjoys games, and has recently been enjoying Monkey Island on the iPad, and Star Wars on the iPod. With a busy lifestyle - riding in the car, small chunks of time here and there, a mobile gaming device is perfect. We have, and love the Xbox 360 (check my raptr account! ), but our leisure time is being shifted from console, TV, movies, and more to mobile, and what we have on our devices. So what does the future of gaming hold? Probably something in your hand.